Over the past few years, the pace of play at H. Smith Richardson has become increasingly poor. It is not unusual for an afternoon round of golf to take in excess of 5 hours to complete. This unacceptable pace has led to the frustration of golfers and a loss of patronage. In order to rectify this situation, a new pace of policy will be put into effect and strictly enforced in. 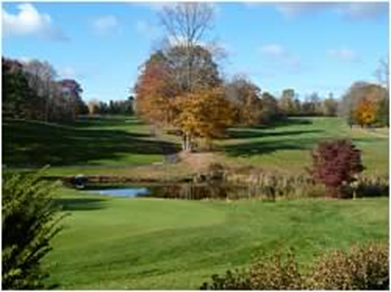 H. Smith Richardson Golf Course, while challenging, should not take more than 4 hours and 15 minutes for a foursome of golfers with average skills. The course is well routed and there are no lengthy walks between greens and tees. Accordingly, it is believed that the front nine should be completed in no more than 2 hours and 8 minutes and the back nine in no more than 2 hours and 7 minutes. Beginning in 2007, every group that tees off before 2:00 p.m. will be given a Pace of Play card (POP). The POP card will break down the entire 18 holes and where each group needs to be in relation to their tee time (see example below). Upon the completion of the round, the group will return the card to the Starter, Ranger or Cart Attendant. Failure to complete the round in the allotted time will result in the four members of the group being recorded on the Slow Players List (SPL) by the Starter. If a person's name appears on the SPL three times, that person will be restricted from teeing off prior to 2:00 p.m. The on-course enforcement of the POP will be the responsibility of the Rangers, Starters, and the Professional Staff. Every group on the course will be required to present the POP Card upon request to any staff member during the course of a round. If a group is discovered to be out of position, a first warning will be issued and the group will be asked to make up time and get back in position on the course. If after two holes from the first warning, the group which is still out of position, they v.il1 be instructed to pick up their balls and proceed to a point directly behind the group in front of them. If, after a second warning, the group again falls out of position, they will be asked to stand aside and allow the groups behind them to play through. They will be allowed to resume play after being instructed by the Ranger that there is an opening. If all three violations occur on the front nine, a 9-hole refund may be issued to each member of the group in the interest of maintaining the pace of play for the other patrons on the course. Likewise, if a group is uncomfortable with thePace of Play Policy, they may request a 9-hole refund at the turn. In addition, each player's name will be added to the SPL by the Starter. All clubs, leagues and tournaments will be subject to the Pace of Play Policy. Exceptions will not be made and it is the responsibility of each club or league to inform their members of the policy. If possible, the golf professional staff will assist the clubs and leagues in explaining the guidelines of the Pace of Play Policy and the implications of failing to adhere to the Pace of Play Policy. 1 14 min. 10 15 min. 2 13 min. 11 13 min. 3 10 min. 12 11 min. 4 13 min. 13 17 min. 5 15 min. 14 15 min. 6 16 min. 15 13 min. 7 14 min. 16 12 min. 8 11 min. 17 13 min. 9 22 min. 18 18 min. Times indicated are times to be on the tee for each hole. Off the 18th green at 12:15 p.m.